Provide comfort for the family of Ronald Daniels with a meaningful gesture of sympathy. It is with great sadness that we announce the passing of Ronald Glen Daniels, late of Prince Albert, SK, on April 10, 2019 at the age of 65 years. Ronald was born on June 9, 1953 in Prince Albert, SK, to parents: Abel and Susan (nee Moosehunter) Daniels. Ronald will be lovingly remembered by his sister: Irene Ermine; his nephews: Preston Ermine, Jan Ermine, Kenny Ermine, Derek Ermine and Christopher Ermine; his niece: Adrianne (Rubin) Ermine; his brother-in-law: Daniel Nokusis & Family, Willie Ermine and Gordon Ermine; his sisters-in-law: Mary Rose Naytowhow & sons, Darlene Napope & Family, Marie Joseph & Family, Linda Daniels & Family, Rena Ermine and Katherine Longjohn; his special grandchildren: Santana, Kayleen, Easton, Torence and Salisha & family; his special nieces: Patricia & Elaine Naytowhow; and numerous nieces, nephews and grandchildren. 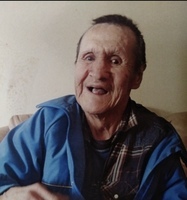 Ronald was predeceased by his parents: Abel and Susan (nee Moosehunter) Daniels; his grandparents: John and Elizabeth Moosehunter; his nephew: Leon Ermine; his brother: Arthur Daniels, Chief Wesley Daniels, Allan Daniels and Michael Daniels; his sisters: Elma Daniels and Ruth Daniels; his uncles: Samuel and Colin Moosehunter; and his aunties: Aurora Joseph (nee Moosehunter) and Kathleen (Allen) Sparks (nee Moosehunter). A Wake Service will be held on Saturday April 13, 2019 at 5:00PM at the Sturgeon Lake Community Center in Sturgeon Lake, SK. A Funeral Service will be held on Monday April 15, 2019 at 11:00AM at the Sturgeon Lake Community Center in Sturgeon Lake, SK. Interment will follow the Funeral Service at the West Central Cemetery in Sturgeon Lake, SK. Arrangements in care of MacKenzie Chapel & Crematorium Brian and Bev Stobbs, Renée Phaneuf - Funeral Directors. www.MacKenzieChapel.ca . 306.763.8488. To send flowers in memory of Ronald Glen Daniels, please visit our Heartfelt Sympathies Store.